Many people have asked us about sea level; below are answers to a selection of their questions. Click on the questions to show/hide the answers. Please note that the usual NERC disclaimer applies to any information given. 1. Will my house be under water in fifty years? We are often asked whether it would be wise to buy a house by the sea in the UK in light of publicity about climate change and sea level rise. The first thing to realise is that changes in sea level around the UK vary considerably around the local Mean Sea Level (MSL) due to our large tides and winter storm surges. When high tide and surge occur simultaneously, an extreme high water level results, which at certain times can be much higher than normal levels. 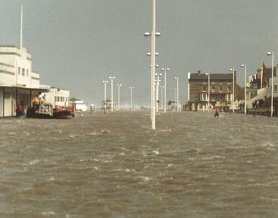 For example, the early 1990s witnessed a number of extremely high water levels as a consequence of the strong westerlies at the time, which climatologists have related to the North Atlantic Oscillation. In addition to the combined MSL + tide + surge water level, wind waves need to be considered, which can be large during storms and which can lead to flooding by overtopping defences. Hence, residents near the coast clearly have to be prepared for a wide range of sea level change, even in normal times. The Intergovernmental Panel on Climate Change (IPCC) Third Assessment Report suggests that MSL may rise by approximately 50 cm in the next 100 years, and that regional meteorology may also change, which would affect the magnitude and frequency of storm surges (the astronomical tides themselves would not be affected in any major way). These changes could add significantly to the possibility of flooding in certain areas. However, it is important to realise that most MSL change will happen in the second half of the next 100 years, as climate change takes a hold, and in the next 50 years one might expect MSL change of order 10–20 cm. This is an important factor for coastal engineers to consider, but in most cases will have little impact on individual house owners. You should enquire about your Local Authority's policy on coastal protection in your area, taking into account the potential sea level changes in the future. If coastal protection is not adequate already, climate change may make the problem worse. 2. Where can I obtain UK sea level data? Sea level data recorded at the UK National Tide Gauge Network's tide gauge stations (as 15-minute or hourly values of sea level; recorded values of high and low waters; annual maximum and minimum levels, and so on) are data banked and can be obtained from the National Tidal and Sea Level Facility. 3. What is meant by terms such as 'a large high tide'? Oceanographers refer to the observed level of the sea at any moment as 'sea level' or 'still water level' (the level not including high frequency changes due to waves). This level includes components due to the 'astronomical tide' (the moon and the Sun), the action of winds and air pressures especially at times of major storms (known as 'storm surges'), and changes in the mean level (due to climate change or to vertical land movements – see below). Terms such as 'tide level' and 'sea level' are often confused. For example, an especially 'high tide' in winter would be most likely a result of a large value of the astronomical tide superimposed upon which is a storm surge. 4. Is the tide the same everywhere in the British Isles? No. Tidal ranges (the difference in height between high and low tide) are largest in the Bristol Channel and other parts of the eastern Irish Sea and in the Channel Islands than, for example, along the East Anglian coastline and in the western Irish Sea. An important safety point is that, because tides are not the same everywhere, tidal information from London, for example (often included in diaries), must not be assumed to apply elsewhere. Coastal users should always obtain copies of local tide tables. 5. Where can I find data on long term sea level changes measured at UK sites? Monthly and annual mean values of sea level measured at UK sites since the 19th century contribute to the data archive of the international Permanent Service for Mean Sea Level (PSMSL). Annual mean values of sea level from Aberdeen, North Shields, Sheerness, Newlyn and Liverpool, which are the five longest sea level records in the UK, are shown in this figure. Time series from over forty other UK locations can be obtained from the National Tidal and Sea Level Facility. All NTSLF data are provided free of charge. 6. Are long term changes in sea level the same everywhere around the UK? No. Long term changes in sea level measured at the coast, by tide gauges, are a consequence of 'real' changes in the level of the ocean (for example, due to climate change), to which must be added changes in the level of the land. Most knowledge of the pattern of vertical land movements in the UK comes from geological data. This map was constructed by scientists at Durham University, and showing uplift in Scotland versus submergence in south-east England. This 'tilting' of the UK is largely a consequence of a geological process called Glacial Isostatic Adjustment (GIA). It results in sea level rising less rapidly in Scotland than in southern England (compare Aberdeen and Sheerness in the above figure). Land level changes have been investigated by the National Oceanography Centre and Nottingham University using the Global Position System and Absolute Gravity techniques. 7. Why is global sea level rising? How much did it rise in the past 100 yrs; what about the next 100 yrs? Global-average sea level is believed to have risen by between 10–20 cm during the past century (for example, see the change at Newlyn in above figure in question 5, which is typical of many records worldwide). Best estimates are that it will rise by approximately 50 cm in the next 100 years (an acceleration of a factor of three in the rate). Rising sea levels are largely because of the thermal expansion of the ocean, melting of low latitude glaciers (for example, in the Alps, Rockies) and many other factors, each of which are reviewed every few years by the Intergovernmental Panel on Climate Change (IPCC). 8. How will a sea level rise of 50 cm affect the UK? As an example, a rise of 15 cm in sea level on the east coast of England, where there are extensive areas of low-lying land, roughly doubles the probability of over-topping a coastal structure (such as a sea wall) due to tide and storm surge. Consequently, a rise of 50 cm (approximately three times 15 cm) would result in an eight-fold (almost an order of magnitude) increased probability. Population centres and valuable infrastructure will require enhanced protection. The so-called '1000-year return period' level, shown in the opposite map, is the level (of order 10 m or so above mean sea level) which should be exceeded only every 1000 years given the present-day statistics of tide and storm surge. By definition almost, these will also be the areas which will be most affected by a rise of mean sea level. 9. I want to buy a house by the sea. I have heard about climate change. But, is this a sensible thing to do? It is probably as sensible as it would be without climate change, given the ferocity of winter storms even in 'normal' times. The rise of 50 cm projected for the next 100 years is expected to occur mostly in the second half of the this century. Consequently, rises of level for the next 20–30 years (within your remaining lifetime) can be expected to be similar to those for the past 30 years (of order 10 cm). You should enquire about your Local Authority's policy on coastal protection in your area, taking into account the potential sea level changes in the future. If coastal protection is not adequate already, climate change may make the problem worse. 10. How often do tsunamis affect the UK? Along the coasts of the northern North Sea, Norwegian sea and north eastern Atlantic ocean a very prominent sand layer was originally thought to have been deposited by a storm surge. More recently, it has been attributed to a large tsunami circa 7,100 years ago. This event was generated in the Norwegian sea as a result of the second Storegga submarine slide, one of the world's largest underwater slides. Probably the most destructive tsunami in Europe during historical times occurred on 1 November 1755. An earthquake (now known as the Lisbon Earthquake) took place 200 km offshore from Portugal. The subsequent tsunami destroyed a large part of Lisbon and raised sea levels at Newlyn (Cornwall, UK) by up to three metres in ten minutes. Further information on tsunamis, and tsunami risks. 11. Where can I find out more about tides, storm surges, sea level changes?